July 27th, 2007 : Sunny and Hot, Water Temp 84* and Clear. Met clients at 5:15 and went uplake and caught 220 Herring for the days fishing. Checked a few channel bends in 35' of water but only saw a few fish so I worked my way down till I noticed I kept seeing fish on the breaks from 28' to 32' so I set up on a long ledge and started getting hits. We worked the ledge for 300 yards and got hits every 50 yards , thought we could do better so we started searching for larger schools. Hit a couple of other areas and set up on one channel bend where we spent the rest of the morning. We had 200 strikes today, clients catching 25 fish and keeping a few Stripers and Kitties for dinner tonight. NOTE: I must have got 8 calls from other fisherman who could not catch fish today. With the water temp climbing , the lake level falling 18 inches in the last week and very little oxygen in the water the Stripers are not gorging themselves like they have been the last 2 months. Most fisherman have been spoiled lately with the easy fishing and now they will have to work for their fish. 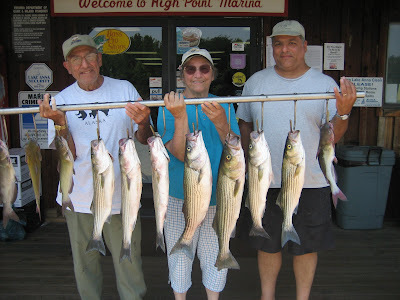 The days of schools of thousands of fish and just finding a large group of boats and running up to them and catching Stripers may be over for a while. Be patient, be versatile, be persistent, use your depthfinders more hunting for the Stripers, be confident when the fish want to eat that you can catch them.